Breaking news: in some areas, medical practitioners either won't or legally can't continue prescribing prescription strength sleep medication to people over the age of 65. Why, you ask? Well, to make a long story short, there's evidence now which suggests that these medications can leave elderly brains more vulnerable to age-related diseases such as Alzheimer's and Parkinson's, just to name a few. It isn't just older people who are vulnerable to such side effects, either. You don't need to have hit this arbitrary age threshold for these drugs to cause the same type of brain damage. It can happen to the young and old alike. So what should you take instead? Answering that question can be tricky. There are many different natural, safe supplements out there which can help you feel drowsy at night so that you get better sleep. 5-HTP is among them. But how effective is it? How does it work, exactly? And is it the best thing you can take for sleep problems, or is there something else you should be using? Below, we will answer all of these questions and more. 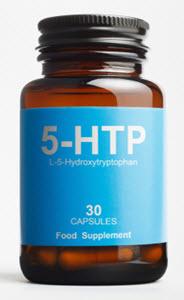 5-HTP is short for 5-hydroxytryptophan. Some people also refer to it as oxitriptan. Whatever you call it, it's an amino acid that occurs naturally in your body. You can synthesize it on your own, or you can get it indirectly from the food you eat. Either way, it can be broken down and converted into serotonin, the neurotransmitter which is responsible for making people feel happy. Some people believe that a lack of 5-HTP may also result in a lack of serotonin, which may cause depressed mood, anxiety, and of course, sleepless nights. Although serotonin is more of a daytime hormone, it can still help you get better sleep at night when you have greater amounts of it circulating through your brain. Maintaining a stable level of serotonin in your system means that you are less vulnerable to emotional stress throughout the day. And when night time comes, you will have fewer stressful things to think about while you are trying to sleep at night. So as you can see, it's good to have a decent amount of 5-HTP in your body regardless of the time of day. But that isn't all 5-HTP does. There's another "-tonin" which your body can make out of 5-HTP: melatonin. As you may or may not know, melatonin is the sleep hormone your body produces at night when it becomes dark. Melatonin plays a part in many different functions in your body, but its most useful role is signaling your brain to get ready for sleep. Without it, you are more likely to feel wide awake or even anxious when you should be winding down for bed. Unfortunately, your body doesn't always produce as much melatonin as it needs, nor does it always produce it at the right time when you need to sleep. But getting more 5-HTP into your system is one of the best ways to encourage more melatonin production. When you give your body the pieces it needs to form this essential sleep hormone, you'll be feeling more relaxed and ready for bed. You'll also experience a much more restorative rest that'll really help you power through the next day. For starters, you can encourage your body to produce more 5-HTP by eating the right foods. Your body creates 5-HTP by breaking down an amino acid called l-tryptophan. This amino acid can be found and high protein meats, like turkey. Have you ever eaten a big thanksgiving meal and felt like you were going to fall asleep right after? That can be attributed mostly to its high l-tryptophan content. You can also find l-tryptophan in dairy products, certain nuts, and high protein vegetables if you don't regularly eat meat. Before you radically change your diet just too improve 5-HTP production, though, you need to ask yourself if it's worth all of the trouble. For one, you have to buy a bunch of new, expensive groceries and spend more time preparing meals that you may not be very familiar with. Next, what little l-tryptophan your body absorbs from your food has to be converted before it can synthesize 5-HTP and use it effectively. Finally, you'll have to specifically time your meals so that your body makes enough of 5-HTP in the evening to help you sleep. Even if you do everything right, there's no guarantee your body will produce enough 5-HTP, or if you will produce it at the best time of day. You're still basically throwing darts in the dark and hoping that you hit the bullseye. This is why some people believe that 5-HTP supplements are the better way to go. Should You Supplement With 5-HTP? If you're thinking about adding a 5-HTP supplement to your daily routine, you can certainly do so. You can purchase an ample supply for pennies on the dollar at most vitamin stores or even your local pharmacy. But there are some downsides to this. For starters, who wants to take a dozen different supplements in the same day? It's easy to make things simple by getting a natural sleep aid which combines several different ingredients - 5-HTP among them - to get the best possible sleep. If you find a supplement that contains 5-HTP and is designed to make sleep easier, then you'll want to take a closer look at the label to make sure the formula has other helpful ingredients, also. Melatonin is one of the most important ones, and it should definitely be on the label right next to 5-HTP for any natural sleep aid that you buy. Melatonin and 5-HTP work hand-in-hand to improve serotonin levels in your brain, which also helps with sleep. Many sleep supplements also contain GABA, which is a mood enhancer and an anxiety reducer. The good news is that these types of natural sleep aids are very easy to find - so if you do decide to incorporate a 5-HTP supplement into your bedtime routine, make sure it contains these helper ingredients (among others) if you want to get the most restorative rest.